This sprightly little sailing dinghy is a throwback to the days when a sailboat wasn’t a sailboat unless it had at least two sails, no matter its size. Yet, here is the sloop rigged Tribute with modern lines, produced of contemporary materials and methods. 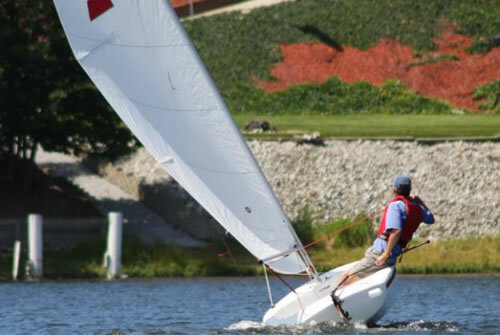 Its modest dimensions (13’2″ length) belie its capacity for sailboat fun. This is a sailboat that was designed to be easily sailed by one person but will carry up to 3. The Tribute has a generously sized cockpit with molded-in fore and aft seating. All corners and edges are rounded for maximum comfort. 4.4 out of 5 based on 5 user ratings. Check out our Testimonial page to view the exciting things your customers have said.